As you will no doubt be aware, HMRC are implementing Making Tax Digital for Business (MTDfB), beginning with Making Tax Digital for VAT (MTDfV) on 1 April 2019. Depending on your business type, you can use the system to comply with this in two main ways. Use the API-enabled features of the system to report directly to HMRC. This is suitable for managing agents who deal with HMRC directly on behalf of landlords, or property owners whose VAT return only includes property management activity (meaning all of the digital records for VAT already exist on the property management software). Export the information from the system in a digital format. This is suitable for anyone who wishes to send the information to a client or an accountant, or needs to collate the information with VAT activity from other software packages prior to reporting to HMRC. There are numerous ways of exporting the required information, the method you use will depend on where you wish to collate the information (e.g. in an API-enabled accounts package such as Sage or an API-enabled spreadsheet, in a bridging document, or by sending a summary document to the landlord). We are currently finalising the testing of the API-enabled features of the system and will shortly be releasing updates to all users who subscribe to the Software Support Scheme. We have recently sent out questionnaires to all users who subscribe to Software Support, to ask for feedback and suggestions to help us shape our development programme for the next 12-24 months. The questionnaire contains a list of our own suggestions for features that could be added to the system, as well as suggestions for extending existing areas of the system. There’s a section that allows you to prioritise which of these you are most interested in, as well as making your own suggestions for new features. We will collate the feedback we receive from the questionnaire and use this as the basis to prioritise our development schedule. As always, we welcome feedback from our users and we look forward to continuing to provide new features to you as part of our rolling development programme. In April 2019 the government is introducing new statutory requirements for residential property agents requiring that they become a member of an approved Client Money Protection Scheme (CMPS). As it is envisaged that the providers of such schemes will require very specific details of their risk in order to provide cover, we are currently working on an update to provide this information automatically. Agents working to RICS regulations have already been asked to provide this information by 19th October 2018 (https://www.rics.org/uk/news-insight/latest-news/news-opinion/client-money-mandatory-data-request/). Whilst that is too short notice for us to provide a fully automated feature, we have in the interim compiled a factsheet detailing the best way to obtain the information. We look forward to providing a full feature for this requirement in the very near future. Please see below some of the features and enhancements released over the last 9 months. The job tracking facility is an extra feature provided in addition to your routine office procedures. It enables you to record and monitor works undertaken on behalf of your clients. The feature is flexible in that it can be used to record minimal details in respect of minor instructions, or fully utilised for monitoring major projects as they progress. A full audit is automatically updated by the system when job details are updated or additional activity is posted. Although emailing of statements has been possible for many years, the way in which this is done has recently been improved to require minimal input from you. You can choose at a system-wide level what should happen to each type of statement report (e.g. print, email, save pdf only) but can override this for individual clients if needed. When you generate a statement, if you’ve selected for it to be emailed, it will automatically be sent to either your Drafts folder or your Outbox (depending on your selection). Although emailing of job sheets has been possible for many years, the way in which this is done has recently been improved to require minimal input from you. You can choose at a system-wide level what should happen when a job sheet is generated (e.g. print, email, save pdf only) but can override this for individual suppliers if needed. When you generate a job sheet, if you’ve selected for it to be emailed, it will automatically be sent to either your Drafts folder or your Outbox (depending on your selection). 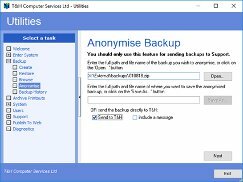 All system updates released since May 2018 have included a facility to allow you to anonymise data backups prior to sending them to us, to help you comply with GDPR (General Data Protection Regulation). If you send us an anonymised backup, all fields which could contain personal data will be anonymised, meaning we will see record IDs rather than names, addresses, email addresses etc. Sometimes it is necessary to send a backup to Support, whether it’s to enable us to assist you with a query or so that we can check for data corruption if errors have occurred. Rather than having to deal with bounce backs when emailing large files or uploading backups to an external site, you can now send them directly to us via Utilities. Additional functionality is now available on service charge plans, allowing you further control and choice in how individual transactions are to be recovered from the tenants at the service charge year end. You can now create Ad hoc Plans. These are Plans that exist outside of a timeline i.e. they are standalone Plans for 1-off or ongoing use. You can now specify directly on a service charge expenditure which Plan is to be used for calculating liability at the year end. This chosen Plan can either be one of the new Ad hoc Plans or an existing timeline Plan which can be different from the default Plan/Plans that would be used based on expenditure date/date span. 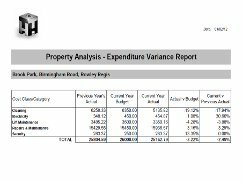 You can now view which Plan an expenditure is expected to use at the year end on the expenditure tab of the Property Record. When using the optional feature of Direct Recovery (i.e. utilities demanded from the tenants in addition to their regular service charge), you can now specify either a specific Plan (Ad hoc or timeline) to use or specify a date range to use existing timeline Plans. Please speak to Support if you would like to discuss this in more detail. Irregular lease breaks. If lease breaks do not occur at regular intervals (e.g. break 1 is after 1 year and break 2 is after 3 years), these can now be recorded and will be entered into the system’s diary. Additional final decorations. If the lease stipulates a final decoration which falls outside the regular pattern (e.g. every 5 years and then 3 months prior to expiry), this can now be recorded and will be entered into the system’s diary. Energy performance certificate details. 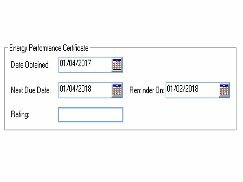 You can now record when the certificate is next due and when you would like to be reminded (both of these dates will be entered into the system’s diary). If you opt to run a mixed use property as one property (rather than as two separate properties to avoid involving commercial tenants in the Section 20 process), there are now two different methods available to you. Which method you choose depends on how you’d like information to be shown to the tenants. Each method simply requires you to perform some set up steps to inform the system of how the liability needs to be split for different types of expenditure, then you can handle posting transactions in the same way that you would for any other property. At the year end, the system will automatically apportion the expenditure, displaying gross figures to residential lessees and nett figures to commercial tenants. System updates are now sent via an improved method. Enhancements have been made to the grids throughout the system. 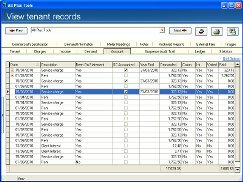 Extra contact fields on the client and tenant records. Improvements to ledgers so that separate ledgers can be automatically generated for service charge, sinking fund and other property pots without the need for filtering. As you will no doubt be aware, GDPR (General Data Protection Regulation) is coming into force soon. We are updating the system to ensure that if you need to send data to us, you can do so in a way which does not require you to share personal details of clients, tenants, etc. Please see below some of the features and enhancements released over the last 12 months. The screen that appears before you process a service charge year end has been redesigned to allow you to drill-down to see more information about how the figures have been reached, to assist you with checking the year end and diagnosing issues that need to be corrected. You can still opt to check your figures using a Practice set of reports, or by performing a mini year end if you prefer, but the new screen is especially useful in investigating anomalies and finding answers to some of the most common questions that arise. The screen displays the information in grids, which are particularly useful as they allow you to filter, sort, group etc to quickly pinpoint the information you require. Here are some examples of questions you can quickly answer by making use of the new screen. Q. A tenant’s demanded total seems lower than expected, what’s included within it? A. Look at the Demanded tab for the tenant to check the dates and amounts of each charge being called in. Click the ‘View record’ button from the year end screen to jump to the tenant’s record to take a closer look at their account. Q. The client is being made liable for something, why? A. Look at the Adjustments tab for the client. If there is a cap or flat rate on one or more tenants, anything over that amount will be assigned to the client. The Adjustments tab will show a breakdown of each of these amounts. Q. A tenant is being made liable for an amount even though they moved out last year. A. 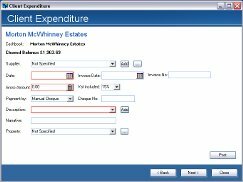 Look at the Allocation tab to find out exactly which expenditure items are part of their liability, as well as which set of plan %s those expenditure items are using. As well as the new screen, there are also additional checks in place so that the system will alert you if it finds obvious input errors, e.g. a service charge plan where the %s don’t add up to 100%. The way in which you track how much the client has loaned or contributed towards void units for service charge has been improved. There is now an additional tab which shows the trail of transactions made between the client and the service charge pot. The new tab also lists any client liability which may have arisen at a service charge year end (e.g. if the client had to fill a gap caused by a tenant’s service charge cap). Job sheets sent to suppliers can now be viewed from a central screen as well as from individual supplier, property and client records, therefore allowing you greater flexibility in how you choose to look for a job sheet that has been sent. 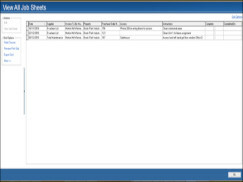 Each grid lists the details from the job sheet and you can also choose to open the job sheet pdf from there. When you receive an invoice file from a supplier (e.g. 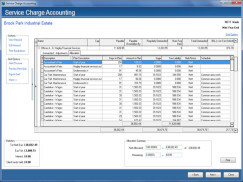 a PDF) you can add it to the system and link it to the expenditure transactions it relates to. 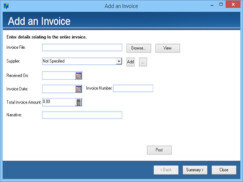 This allows you a quick way of opening the invoice when you view the transaction at a later stage. An extra column is available on the relevant grids at client, property and tenant level to allow you to see how much commission has been taken from each amount received from each tenant. As this information is displayed in a grid, this allows you the flexibility to be able to filter, sort, group, export etc so that you can draw up different reports for different reasons. If you use the surveyor facility to keep track of which member of staff deals with which records, this has been extended and is now more flexible. 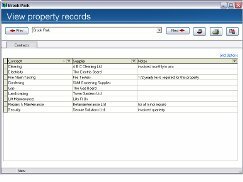 You can record who deals with each client, property and tenant, then use that information to be able to filter various lists and grids throughout the system. You can also choose to include the surveyor’s reference on reports such as demands and arrears letters. An updated version of the User Manual has been sent to all users. You will be able to find the User Manual within the folder your system is stored in. In future, whenever a new version of the User Manual is available it will be included on an update and will automatically replace the copy in that folder, meaning you’ll always have access to the latest information in one easy to find place. Additional fields at property and tenant record levels. Changes to the files required for emailing to ensure compatibility with the latest Microsoft Office updates and the newest versions of Outlook. Improvements to the speed of areas of the system, such as BACS exporting. The ledger screens at cashbook, client, property and tenant level are a popular way of tracking down transactions, viewing a balance as at a given date or generating a report showing the activity within a certain period. The latest update allows even greater flexibility on these multi-purpose screens, as you can now choose whether information is shown in the order it was entered, or based on the dates you typed in when posting the transactions. Both dates can be displayed on the screen, allowing you to easily spot erroneous entries, or corrections which may have intentionally been backdated. You can already generate multiple reports to assist with arrears chasing; from basic arrears reports showing the total each tenant owes, to arrears itemised by charge, to aged debtor reports. There is now a further style of arrears report available to choose from, which displays information about when each outstanding charge was originally demanded from the tenant. 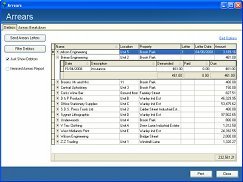 Alternatively, you can still choose to create your own report (or export the information for import into packages such as Microsoft Excel) by including or removing columns from the arrears screen and then grouping, sorting and filtering the information to suit your specific requirements. Allowing you to reconcile a day’s worth of transactions at a time, and save the session when you’ve found all of the transactions for each day and are happy it matches your bank statement balance. If you then struggle to get the next day to reconcile, you can simply start again from where you’d last saved. If you notice a mis-posted transaction whilst reconciling, or realise a transaction hasn’t been posted, you can save the session, exit the reconciliation process and make any corrections required, then go back to where you left off. If you reconcile your cashbook on a monthly basis and want to continue getting monthly paperwork, but find that there are a lot of transactions to work through if only reconciling once a month, you could choose to do a ‘mini’ reconciliation once a week, or even once a day if necessary. To do this, you would go into the reconciliation screen, present all the transactions that appear on your bank statement for that week/day and then save the session. When you got to the next week, you’d simply continue in the same way, and then at the end of the month you should find that you’ve presented all of the transactions shown on your bank statement for the month and can just hit ‘Reconcile’ to produce the final paperwork. When paying suppliers by BACS, the system has long been able to create an export file for you to import into your bank’s BACS package, which greatly speeds up the process of paying multiple invoices and suppliers. 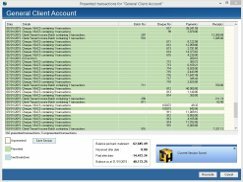 The system now has a new method of batching the BACS payments so that when you perform a cashbook reconciliation on the system, it should match the way that the payments are displayed by your bank, therefore making the reconciliation process simpler. Features have long been available to deal with separate ‘pots’ of money relating to a property (eg Service Charge and Sinking Fund). You are now able to have additional pots, which may be useful if for example you want to collect money in which won’t be paid to the client, and needs to be kept separate from general service charge funds (for collecting payments relating to utility bills, for example). If necessary, you can still choose to reflect this activity in the service charge year end accounts, please speak to Support if you would like to discuss this. As standard, the system uses the default email profile setup on your machine, to allow you to easily automatically email reports such as demands, BACS remittances and arrears letters without having to worry about filling in email settings. If however you’d prefer to send emails from a different account, you can now fill in the details of the account you’d like to use. This settings will be remembered so you’ll only need to fill them in once, and you can have different settings if required for different machines (or different user profiles on the same machine). Background changes to how VAT is stored and calculated throughout the system, which will allow for greater flexibility in future. We now have available a server version of the system which will allow for making backups utilising the speed of the server. Additional fields at client and property level which can be included on picklists throughout the system to allow you more options when searching. The system’s correction facilities have been streamlined into a new corrections screen. The screen lists the corrections that can be performed and provides a brief overview of why each correction should be used, therefore helping the user to decide how best to proceed to get the results they want. As you click onto each task, further information is displayed, advising you how the correction will be reflected throughout the system, where necessary. Whilst it has always been possible to write off arrears on the system, the process is now much more automated. With just a few simple steps, you can write off multiple arrears charges and the system will ensure that this is reflected correctly in all areas. 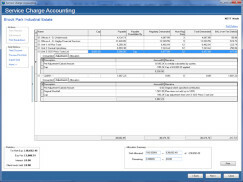 The system will then automatically handle creating contra charges, allocating these against the arrears charges and ensuring that when you next generate a report such as a client statement or a VAT report, the relevant information is shown. It is now easier than ever to analyse management commission activity within the system. 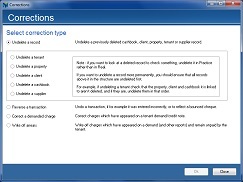 Two new screens have been introduced which allow you to easily find out information such as the commission amount held at a specific date (for the whole portfolio or within a specific cashbook), how much commission has been taken within a certain period, how that is broken down between commission on rental income and service charge, how much commission has been taken per client or property etc. Whilst all of this information had been obtainable in the past, it was split across various reports and in some instances you could only view information for one client at a time. The new screens allow you to get an overview of the whole portfolio if you wish, whilst still allowing you to drill down and analyse information in more detail if necessary. 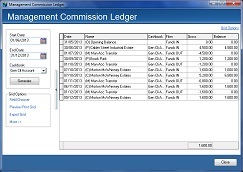 If you wanted to analyse how the commission balance has changed over a certain period you would use the management commission ledger screen. This will show an opening balance as at the start date you entered, each transaction that has gone into or out of commission upto the end date you entered, with a running balance for each transaction. You can of course export this information for use in Excel, if required. If you wanted to be able to group by commission type or client for example, or filter out information to analyse commission in more detail, you would use the management commission analysis screen. This allows grouping, sorting, filtering, exporting in the same way that other system grids do, allowing you to use the screen to find information easily and generate reports showing the information you need. Updates to the notices which are printed with ground rent demands, service charge demands etc to reflect the latest changes in legislation. Further reports are now archived automatically as pdf files by the system, therefore negating the need to keep paper copies. The debit and credit batch lists that print as part of a cashbook reconciliation have been re-written to be more efficient. Extra columns added to grids throughout the system, allowing you to group, sort and filter on more criteria. Changes behind the scenes so that the system is more robust if it encounters issues gaining access to its data files (if for example they are temporarily locked by anti-virus software). New warnings have been implemented which give the user unobtrusive feedback if the system detects that 3rd party applications are interfering with its attempts to access files. 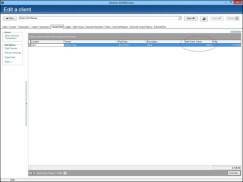 A new internal memory manager has been incorporated which provides a number of performance enhancements. Enhancements have been made to the way databases are upgraded with new versions, which should greatly speed up the process. All of the features listed above are available free of charge to all users currently subscribing to Software Support (subject to compatibility with your current settings). If you would like to discuss any of the options or request an option to be included on your next update, please speak to Support. A new feature has been made available to all users who manage commercial properties to cater for the recent implementation of Commercial Rent Arrears Recovery regulations (CRAR). The new feature allows users further flexibility when chasing arrears, allowing them to choose to continue to send reminder letters to the tenants if they wish, as well as allowing them to generate a report to send to enforcement agents, detailing the charges due to be recovered under the CRAR regulations. The system will automate the process as much as possible by selecting the tenants for whom CRAR applies and selecting the charges which can be recovered via CRAR whilst still allowing the user to check and override these defaults if necessary. We have recently improved the emailing facilities within the system, allowing for closer integration with Microsoft Outlook and Microsoft Exchange. When generating reports such as demands, arrears letters or BACS remittances, the system can automatically send these to your Outbox, meaning the time it takes to perform operations such as a demand run can be drastically reduced. You can of course still choose to send emails to Drafts first if you prefer to double check them, or simply check them in the Practice version of the system (where they will print or preview in the usual way) before running them for real. 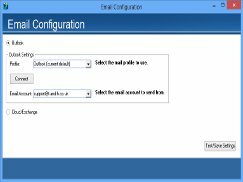 Setup is simple, the system will automatically use your default mail profile, therefore eliminating the need to input email settings on every machine. You can enter a default email message for each type of report per machine (or choose to enter a different message each time if you’d like) and select per tenant/supplier which reports will be emailed, printed or both. A copy of the report will be archived as usual, allowing you to save on paper as well as time. As well as the many existing options for choosing who to send arrears letters to, you can now choose to chase specific items of arrears only. This may be useful if you are only interested in chasing a certain type of charge, eg Service Charge but not Ground Rent, or if you have agreed payment terms with a tenant for one item of arrears but still want to chase payment for something else. To do this, select which tenants you want to send arrears letters to in the usual way, then click the + sign next to any tenants for whom you only want to chase specific items of arrears. This will show which charges make up their total arrears amount, allowing you to select/de-select charges to show as necessary. Various new options for displaying itemised commission on statements. Additional information to be displayed on the demand summary. 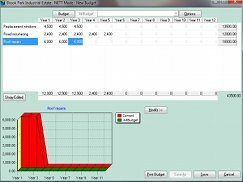 Further options to control the display of VAT on demands. 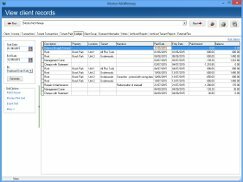 Extended information to be included when exporting record details. More detailed information to display on system messages. Arrears chasing facilities improved to allow more control when applying admin fees for arrears letters. Extended options available for dealing with client groups/syndicates. Further options available for checking reports in Practice. More detailed information to show on transaction listings throughout the system. Improvements have been made to the feature which apportions interest for interest bearing bank accounts. 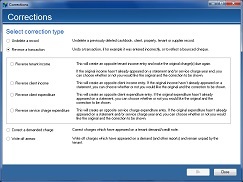 Changes have been made to the screen for setting up service charge plans so it is more intuitive. 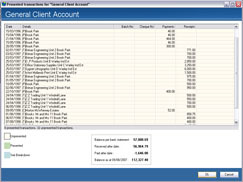 More options are now available to control the display of VAT when accounting to your client. There are now more VAT choices available when posting transactions. Additional information can now be automatically included with an arrears letter, showing a breakdown of charges due and payments made. The July Web Sale has now finished. Thank you to everyone who took part; we look forward to working with you in the future. We are pleased to report that our Web Sale has now been officially launched. Our last one was nearly two years ago and proved incredibly popular, with many of the systems on offer being snapped up within days! This Web Sale begins on the 13th July where we will be reducing our System prices by a massive 40% for the 1st 2 people to apply and a very generous 30% for the next 6. If you’re interested in this promotion contact sales@t-and-h.co.uk or call 0121 585 0234 for your chance to purchase a full property management accounts package at a discounted price but hurry as this offer ends at the end of July and is limited to the first 8 applicants. 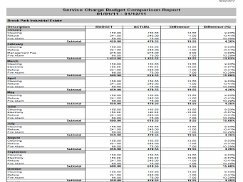 The service charge budgeting facilities have recently been extended to allow the comparison of budgeted expenditure against actual expenditure at any point throughout the year. Budget Comparison By Month – This will show all expenditure budgeted for each month and the actual expenditure spent so far. You will see the difference in monetary terms (i.e. whether you have spent more or less than budgeted in a particular month) and also represented as a percentage. This report will also let you compare previous years’ expenditure and previous years’ budgets. Budget Comparison By Description – This will show all expenditure budgeted for each description and the actual expenditure spent so far. You will see the difference in monetary terms (i.e. whether you have spent more or less than budgeted for a particular description) and also represented as a percentage. 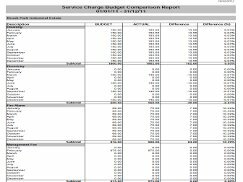 This report will also let you compare previous years' expenditure and previous years' budgets. Year End Variance – This will show all expenditure budgeted and how this compares to actual expenditure spent so far (variance as a percentage). It will also compare your current budget to the previous year’s actual expenditure and show the variance as a percentage. If the service charge is ran on a scheduled basis the comparison reports will show the cost category, as determined by the RICS service charge code of practice. The service charge budgeting facilities have recently been extended to allow you to setup a forward funding budget for expenses that will cover work carried out and accounted for over more than one service charge year and you can enter into the system how much you are budgeting in total, as well as per year, breaking down the forward funding for different types of expenditure if required. The expenditure facilities have been extended to allow the set up of regular payments that come out of your bank account and for the system to automatically post these transactions, following authorisation. When authorising the payments the system will automatically post the expenditure against the appropriate client or property, updating all necessary areas of the system. Improvements to system resilience, including a new level of fault tolerance which is particularly useful for systems operating over a network. Upgraded logging facilities to allow more efficient responses to Support queries. More detailed error reports to enable us to investigate and resolve potential bugs swiftly. As mentioned in our article of 15th June 2011, the RICS have recently introduced changes to the service charge code of practice. The system has now been updated to comply with the RICS code of practice for service charges 2nd edition. Updates have been forwarded to our users who operate complex commercial service charges. As you may be aware, amendments have been made to the Commonhold and Leasehold Reform Act 2002 (Section 166). The system has been updated to comply with this new legislation and updates have been forwarded to our users with Block Management. As you may be aware, the RICS have introduced changes to the 2006 service charge code of practice. The new code (RICS code of practice for service charges 2nd edition) comes into effect on 01/10/2011 and as we understand it, is only applicable to commercial, more complex service charge properties; if you would like to look at the regulations yourself you will find the relevant information on the following link. We have now finalised the changes required and these are currently being tested. We are pleased to announce a new addition to our team. Vicky joined us recently, a welcome addition to our Support and Training team. Vicky has a wealth of knowledge to easily and efficiently assist users with their property management and system based queries. We are pleased to report that our Web Sale has attracted a lot of interest. The 2 systems offered at 40% off have already been snapped up and 2 other systems have been sold under the 30% off offer, leaving only 4 left. If you’re interested in this promotion contact sales@t-and-h.co.uk or call 0121 585 0234 for your chance to purchase a full property management accounts package with 30% off but hurry as this offer ends at the end of November (or once the remaining 4 systems have been sold). Transaction batch lists have been redesigned to include more information, making it easier for you to ensure transactions have been posted correctly. The batch list will now also be archived as standard, allowing easy retrieval at any stage. An additional report is now available which provides a summary per client to show how quickly charges have been paid by the tenants. This report is broken down into rent, service charge etc and is itemised by property, helping you to get a good overview of how efficiently tenants pay. This can be used instead of or alongside the existing arrears chasing reports, allowing you maximum flexibility. Additional columns are now available on transaction grids on the client, property and tenant records, allowing you to see which transactions have been processed through certain reports. These join existing columns which show whether a transaction has been processed through a BACS or cheque run, been on a vat report etc. To add these columns onto a grid go to Grid Options: Field Chooser and drag the column heading to the required place. You can then filter, group and sort the transaction listings as required and print or export a report if necessary. An alternative demand summary is now available as a replacement to the current printed demand summary. This new summary itemises what has been demanded from each tenant showing the description, period, nett, vat and total for each charge demanded. 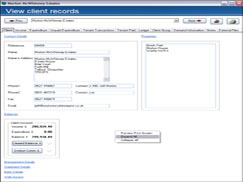 This is useful when checking demands in the practice system as it allows you to see what will print on each demand without having to view each one individually, and when you print your demands in the real system the demand summary will be archived as usual, allowing you to refer back to it at a later stage if necessary. Changes have been made to speed up the printing of demands. The report which is printed after a BACS export has been processed has been updated to allow you to fill in details of who did the export, who authorised it and who checked it. Additional fields are available when entering clients' bank details to cater for overseas clients more comprehensively. Extra information will now print on the audit trails. A wider range of reports archived. Demands, statements, arrears letters, service charge year end printouts, vat reports, tax reports, tenant statements, service charge budget reports, transaction batch lists and supplier jobsheets are just some of the reports which are archived. Improved retrieval facilities. The central screen for finding archived reports has been improved to allow you to enter a date span, select which type(s) of report you wish to view and filter, sort, group etc as necessary. Links within the system. Extra tabs are now available at client, property and tenant level, allowing you to find reports linked to that specific record with ease. 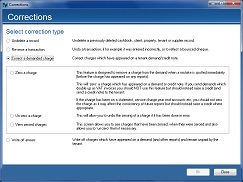 Additional charge descriptions are now available as standard when charging items to the tenant. Some of these are especially useful for tax reports and help to ensure that the reports are clear and concise. Breaks and inspections are automatically diarised along with various other events such as rent reviews and lease expiries etc. Further alarmed triggers can now be setup on breaks and inspections, allowing you to see an on-screen reminder before the event is due. Further options are now available for exporting basic tenant information such as names, addresses and contact details, allowing you more flexibility when creating contact sheets and perform mail merge tasks. You are still able to export all tenant details if required by simply selecting 'detailed' from the export screen. Arrears reports have been redesigned to include more information. System messages have been standardised and improved so that they are concise whilst remaining as informative as possible. Loading supplier information is now substantially faster. Extra information is now included when exporting property records. This facility allows you to record, in a centralised database, contracts held with each supplier both at supplier level and property level. As each contract (e.g. cleaning, gardening, lift maintenance etc) is added, this is linked through to the appropriate supplier or property allowing you to view all contracts for a particular supplier or a specific property. 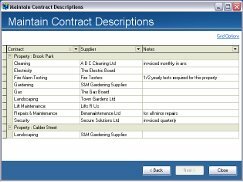 As well as seeing the contract as supplier and/or property specific, you can also view the contracts set up across the whole portfolio with additional features of filtering, grouping, sorting etc the required contract information. When posting expenditure transactions, the screens have been improved to make data input more efficient. When logging or paying expenditure the supplier field is now the first field to complete (to make the process of automatic cheque writing and BACS exporting more efficient) and the fields that must be filled in for the system to process the transaction are now red, allowing less input in some instances. When posting expenditure you can assign a reference number (meant for internal use) to the transaction and this number can be seen on various screens and reports throughout the system. When posting expenditure the system can automatically assign a reference number (meant for internal use) to the transaction and this number can be seen on various screens and reports throughout the system. The way you install system updates (free to users that subscribe to software support) was changed a while ago to make installing new features easier. We have now made improvements to this wizard so that the on screen wizard will now display information about the update just installed and the version overwritten so that Users know that new features are installed seamlessly. We have overhauled the way the system presents VAT report information. You can now generate automatic vat reports on either a 'cash' basis or a 'due' basis calling in all income and expenditure within any required date span. The report itself shows a summary of all nett and vat income and expenditure (calculating how much is to be paid to HMRC) and will detail the transactions making up this amount. If the standard report layout does not suit, an alternative report can be designed specifically for you and you should contact Support for costings if this is your preference. We have overhauled way the system presents tax report information. You can now generate automatic tax reports (section 19) calling in all income within any required date span. There is a choice of report (detailed or summarised) with the detailed report itemising each transaction for each tenant and the summarised report totalling the transactions for each tenant. If the standard report layouts do not suit, alternative reports can be designed specifically for you and you should contact Support for costings if this is your preference. Once the report has printed a csv file will be generated automatically, allowing you to submit the tax return to HMRC with ease. I'd just like to take the opportunity to thank everyone who has expressed an interest in our July websale. As an update: 5 of the 8 available offer packages have now been spoken for (subject to demonstrations etc). The offer will run until the end of the month or until all 8 packages have been sold, whichever is sooner. You can now opt to print historical arrears lists, allowing you to effectively 'go back in time' and get a listing of what was in arrears at a certain date (ie it would exclude anything demanded or paid after the specified date). This can be used alongside or instead of the standard arrears options which allow you to see what is in arrears now and how long that has been outstanding. Debit and credit grids are now available when viewing the cashbook record. 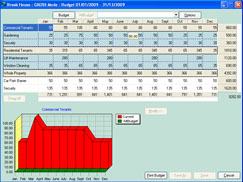 These grids can be used alongside the standard debit and credit listings and are extremely useful for checking transactions in relation to historical cashbook reconciliations as you can add additional columns that tell you the date of the transaction, the date the transaction was actually entered into the system and whether the transaction has been presented as part of a cashbook reconciliation. 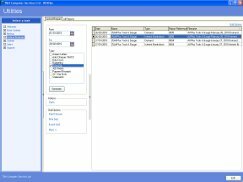 As these screens are in grid format, you are able to use all of the functions available on grids throughout the system such as filtering, sorting, grouping, adding and removing columns, printing, exporting etc to draw off numerous reports. For detailed information on how to do this, please refer to the documentation on grids or book in a tutorial with a member of our Support team. When allocating tenant income transactions, you can now view details of which demand each charge appeared on. This may be useful if the tenant has sent a demand remittance or a demand number with their payment, as it will simplify which amounts you need to pay off. The interest breakdown which accompanies demands has been improved, whilst still showing detailed information of how interest is calculated for each charge on each demand. Additional options are now available for charging interest on late payments. You are now able to choose per charge whether interest should be generated from the demand date or from the due date. This is useful if for example you are demanding an insurance premium and don't wish to backdate interest to the due date, or if you are demanding a rent review and want interest to be charged from the original due date. We have overhauled our main options list and features which will be of benefit to all users are now included as standard in each system. Full details will be available in this year's update documentation, due for release in July 2009. Improvements have been made to the facility for automatically inserting tenant charges based on the lease details entered. The surveyor log feature has been extended to allow you to find tenants assigned to a specific surveyor/manager more efficiently. Alternative ordering options are available for audit trails, allowing you to find transactions with ease. Extra security measures and logging facilities have been implemented. This will reduce the potential for errors and on the off chance that an error occurs, will allow us to track them more efficiently. We have added a 'See notes' tickbox on each of the main record screens. This will be ticked automatically if there are any notes entered for that record. You can now set up independent credit note numbering per client. This will follow through to the credit notes of all tenants linked to that client. You are able to setup a starting number as well as a prefix and a suffix, ensuring that each credit note has a unique reference. Many other credit note numbering and demand numbering options are available; please speak to Support to discuss the best options for your requirements. When generating arrears letters you can now opt for the system to automatically apply a charge to each tenant's account for every letter produced. Set up the amount you wish to charge for each letter and upon generation of a letter the system will automatically apply a charge to each tenant's account and clearly state on that arrears letter that a charge has been applied. Screen headers and footers will now display in a different colour when using practice or browse so that you can tell immediately that you are not in the main system and that any changes made will not affect your real data. Tenancy schedules have been redesigned and now include improved functionality. 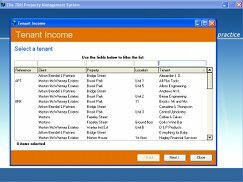 You are able to exclude a tenant from a tenancy schedule if required (if for example a tenant has moved out) and are able to export the tenancy schedules in various formats, allowing you to analyse the data in programs such as Microsoft Excel etc. Extended printing options are now available for service charge plans. You are also able to export plan information in various formats, allowing you to analyse the data as required. When entering how often breaks occur in the lease, you are now able to enter this in months and days as well as years, if required. Various field lengths have been extended on the transaction screens, allowing you to enter more information. Additional information now prints on the cashbook batching lists, allowing you to identify transactions more easily. 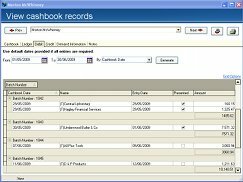 Accessing information from the ledgers at cashbook, client and property level is now considerably faster. An additional cashbook balances list is now available. This will print summarised balances for ALL cashbooks, detailing how much of the balance is rent, service charge, sinking fund etc. This allows you to see at a glance what is being held in each bank account without printing an itemised list for every cashbook. Please speak to Support if you would like any of the above (or variations on any of the above) or any other recurring events added to your system. 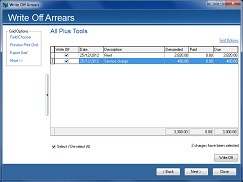 When viewing the arrears grid, you can now see on screen how each arrears amount is made up. This is very straightforward, you simply click on the + sign next to the relevant tenant and the grid will show a breakdown of which charges are in arrears, when they were demanded, any payments made etc. As this screen is a grid, you are able to use all of the existing grid functions here including sorting, filtering, grouping, summing, exporting, printing and so on. Improvements have been made to the 'Copy a tenant' facility which allows you to copy certain details from an existing tenant when adding new tenants (common in the case of block management, where all tenants have the same lease details). This facility has been improved so that additional fields are copied, minimising the input required by you. Alternative statement layouts are now available. Improvements have been made to ensure that entering practice on multiple machines is as efficient as possible. Further options are now available for exporting transactions to your BACS package. Improvements have been made to the rounding of commission amounts. You are now able to print additional block management notices with arrears letters. Additional notes relating to the property can now be printed on the tenancy schedule if required. Additional columns are now available on the ledgers screens at cashbook, client and property level. These will allow you to view more detailed information about the transactions within the date span you have entered. You can now rename service charge schedules per property, allowing you to easily see what each schedule relates to. 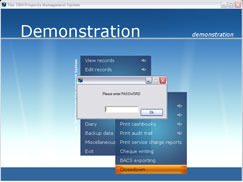 Each schedule has a 'description' and a 'print description'; the ‘description’ is how the schedule will be displayed on screens and picklists throughout the system and the 'print description' is how the schedule will be displayed on external printouts such as budgeting and year end reports. You are also able to select whether a schedule is active or not which will control whether the schedule appears on screens and picklists throughout the system, allowing you to see only the relevant schedules for each property when posting transactions and/or setting up service charge plans. We now have available an option which will suppress the generation of any interest on charges until they have been paid in full. This may be useful if you regularly find that you have not entered all tenant income received before printing demands which would result in false interest being generated. We have improved the facility for viewing an invoice's history, allowing you to easily see the details entered when an invoice was originally logged as well as the details entered when it was paid. This will give you the flexibility to generate various reports on a due basis or a paid basis. Additional arrears reporting options are now available. Improvements have been made to the 'View diary' screen. You are now able to view, sort, filter, group, delete, print and export diary entries more easily. There are now additional options available for displaying tenant overpayments on demands. Amendments have been made to the displaying and deduction of commission. Various improvements have been made throughout the system to improve consistency and usability. Additional information is now recorded in the system logs to enable us to deal with technical Support queries more efficiently. We have reduced the time the system takes to print audit trails. Printing an audit trail will now be upto 50% faster. All of the options listed above are available free of charge to all users currently subscribing to Software Support (subject to compatibility with your current settings). If you would like to discuss any of the options or request an option to be included on your next update, please speak to Support. 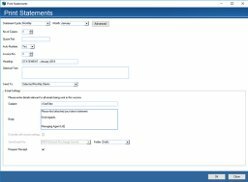 When logging transactions into the daybook, the system will automatically fill in the 'invoice due date' field based upon the information entered on the supplier record. This date will be displayed on screens and listings throughout the system, allowing you to see with ease when invoices need to be paid. These improvements are currently being released on a global basis to all users subscribing to Software Support as part of the on-going update programme. Following feedback from users, we have implemented a warning on all transaction screens which will display a message if you have entered a date more than 1 month prior to or later than today's date. The system automatically emails error messages to us so that we are able to assist you efficiently. We have recently made improvements to the screenshots that the system takes when an error is displayed so that we are able to see more clearly exactly where you were in the system when you encountered an error. From time to time as part of the update programme we focus on one of the main areas of the system and try to incorporate as many new features and improvements as possible. We recently completed revamping the service charge facilities in the system and the next area we are looking to improve is the diary. At present, the system automatically diaries events such as lease expiries, breaks, rent reviews, insurance renewals, inspections etc and prompts you with alarmed triggers in advance of these dates. You are also able to add your own diary events and alarms for any additional events you require. As always, we will endeavor to include as many user suggestions as possible as well as our own ideas. If you have any suggestions on how you feel the diary could be improved, or any features/facilities you would like to see in the new diary, please speak to Support. When entering expenditure you are now able to add a supplier if the supplier you require is not already in the list. To do this, you would simply click on the 'add' button which is dierectly to the right of the supplier picklist. You are then presented with the standard 'add a supplier' form to fill in in the usual way. 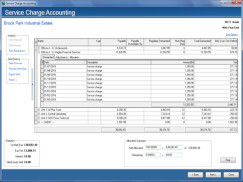 Once you have added the supplier you can continue entering the expenditure without needing to re-enter any information. This should help to make entering transactions more efficient. Extra options are now available for changing the layout of grids throughout the system. This includes being able to change the height of grid rows as well as changing the width of grid columns, allowing you more flexibility when customising screens and designing reports. When posting management commission expenditure you can now select for the system to automatically fill in the full amount due to you by simply right clicking in the amount field and selecting 'Full Amount'. You can now view diary entries from both the property and tenant record. This allows you to easily see entries appertaining to that particular record within the specified date span. All system generated entries (e.g. insurance reminders, lease expiries, rent reviews, inspections, decorations, alarmed triggers etc) will be displayed along with any user added entries. These entries can then be grouped, sorted, filtered etc in the same way as information displayed in other grids throughout the system (see grids documentation for more information). Extra information can now be displayed when viewing the tenant charges schedule. 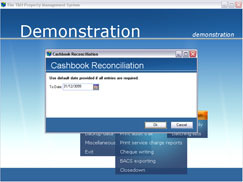 Cashbook reconciliation printouts have been amended to include additional information. Improvements have been made 'behind the scenes' to allow us to easily change the look and style of the system in the future. We have made improvements to the system installation process, which will be useful if you need to move the system to a new computer/server. We have endeavoured to make the changeover period as seamless as possible and hope that none of our users have been inconvenienced by the move. You will now be able to view additional information relating to tenant payments at client level and property level. The grid will allow you to sort, filter, group, print and export information in the same way you can on all grids throughout the system, allowing you to find information and generate reports as necessary. When generating credit notes, the system will automatically number each credit note for you. There are now two different methods to choose from. The first option is for credit note numbering to be independent to any demand numbering facilities already in place. Alternatively, you can opt for credit note numbers to work in conjunction with any demand numbering facilities already in place. We have recently developed an alternative way for you to take your service charge commission. As standard, commission on service charge would be posted as an expenditure amount and would then be analysed in the service charge accounts and apportioned between the tenants based on their percentage liability. You are now able to take commission directly on any service charge amounts demanded from the tenants by selecting 'Yes' to commission when setting up their charges. Commission will be deducted from the service charge account, based on a percentage of the service charge income received. The deduction will then be accounted for in the service charge accounts as usual, allowing you to account for it correctly. Improvements have been made to the 'wizard' style screens which are used in various places throughout the system. Message boxes throughout the system have been redesigned and standardised. Improvements have been made to the archiving of printouts which will allow us to implement various new features in the future. The menu layout has been amended slightly, following suggestions from users. Changes have been made which will speed up access to Practice and Browse. You will now be able to view an on-screen demand summary after printing demands. This will display information about what has been demanded from each tenant, broken down into rent, service charge, sinking fund, nett & vat etc. 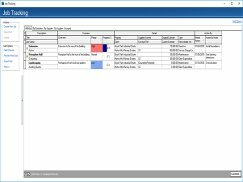 As this summary is displayed in a grid, you will be able to sort, filter, group, sum, add & remove columns, print and export the information in the same way as you can wherever you see a grid throughout the system. There is now an additional method of generating a statement of account for each tenant. This can be generated as often as required and allows you to enter as many different date spans as necessary. This can be used instead of or alongside the traditional statement of account which resets information once it has been shown and shows it as a balance b/f on the next statement. Credit notes have been redesigned so that information is displayed more clearly. When printing demands, you will now be able to see progress messages displaying information about which demand is being printed. We have made improvements to the layout of the Demands to tenants screen so that it is consistent with the other screens in the system. Additional options are available for the printing of meter reading charges on demands. Additional information can now be displayed on the grids throughout the system. This can be done by simply dragging extra columns onto the grid. Grid columns can be added, removed or moved as necessary and the system will remember which columns you have chosen to see so you only need to adjust each grid once. 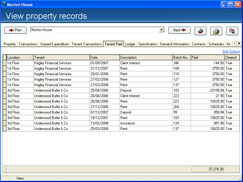 Grids are available in many areas of the system, such as transaction listings at record level, when generating arrears reports and when viewing the diary. A video tutorial on the different ways in which the grids can be used will be available shortly. After joining the team last Autumn and completing her training successfully, we are pleased to announce Amy as our new Training Assistant. Amy will also continue in her role as a valued member of the Support team, assisting users with their property management and system based queries. When printing service charge year end reports, you have the option of printing a mini year end, which will print the cashbook and audit trail printouts only. This will not reset any information, therefore allowing you to draw off these reports as often as required. You can choose whether a full or mini year end will print as default, allowing you to enter minimal information to generate the reports. This feature is now compatible with all existing service charge options. You can now control the displaying and format of this information on a tenant by tenant basis. For example, you can opt to show the suspense amount as a minus charge on the demand (therefore reducing the total amount due) or you could choose to display a message on the demand to inform the tenant that a credit is being held. Alternatively, you can specify that the overpayment should not be shown on the demand at all. Additional information can now be entered when posting a transaction. You can now opt to print additional messages on VAT receipts for tenant income. 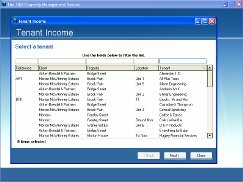 Additional information relating to tenant income can now be seen in various places throughout the system. Improvements have been made to minimise the input required when entering transactions. The tenant income screen has been fully converted to the new 'wizard' style. We have made improvements to the facilities for operating sinking fund accounts (also known as reserve accounts) on the system. Sinking fund balances and transactions can now be viewed in many more places throughout the system and we have also simplified the process of entering balances and transferring money to and from a sinking fund account. As Berni mentioned in her 'What's new this month' post, we've updated the visual controls for entering dates on the system. Rather than attempting to describe all the features here, I've made this small video showcasing their flexibility. Following recent changes to legislation, users running block management portfolios will now be able to print additional notices with demands. The section 153 notice will print automatically with any demands which include service charges and the section 158 notice will print with any demands including administration charges. Information regarding the notices can be found on the links below. 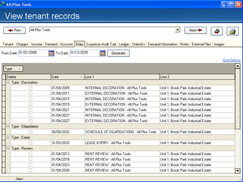 Users who do not currently operate block management will notice that each tenant has automatically been defaulted to 'never print' the notices (therefore allowing them to opt to print the notices for new tenants should they obtain block management in the future), while users with mixed portfolios are able to choose per tenant whether the notices should print. As this option has been implemented to reflect changes in legislation it has been included in the system as a global option. The system will now automatically log users out of the system if it is not in use. This may prove to be a valuable time saving feature for networked users who have commented in the past that colleagues leave the system open, preventing them from entering the system if the maximum number of accesses are in use. The fields on each record have been organised into collapsible groups which can be expanded or collapsed by clicking onto the group headings (hotlinks). This allows you to design your records to show the fields you wish to see on a regular basis. This can be designed per machine, allowing individual users to view only the information that is relevant to them. You are able to easily expand or collapse all groups by right clicking anywhere on the screen, or opt to print the information from the screen which will take into account expanded and collapsed groups. We have improved date fields throughout the system to make entering information more efficient. As well as entering dates in the usual dd/mm/yyyy or dd/mm/yy format there are now many more functions available - more details coming soon. As standard, demands print a remittance slip displaying the name and address of which payment should be sent to, which is typically the address of the managing agent. Following recent requests from our users, the system now caters for tenants who pay directly to the landlord by allowing you to setup an alternative remittance address on the client record. As you may be aware, the RICS have introduced new regulations regarding a commercial service charge code of conduct. As we understand it, these regulations are only applicable to commercial, more complex service charge properties but if you would like to look at the regulations yourself you will find the relevant information on the following link. We have now finalised the changes required and these are currently being tested. Along with the required changes we have taken the opportunity to expand the already composite area of service charge and improve upon the suggestions made by the RICS. There is a required list of cost codes. We plan to hold these codes in a centralised database and link these codes automatically to the appropriate cost class and category. As these codes are 'suggestions' and will not be applicable to all of our users on all of their properties, we plan to allow the user to select by property the codes applicable to each (again linking to the appropriate cost class and category). We will allow the user the flexibility of adding their own cost codes and again selecting the properties that they are applicable to. We will change the service charge budgeting facility to allow the user to budget on multiple percentages (for planned and scheduled service charges) and will allow the user to budget on cost codes used within a schedule. The required changes will be in an updated version of the system later this year and all users subscribing to the software support scheme will get this update (along with all other new features we have developed and are currently working on) free of charge. 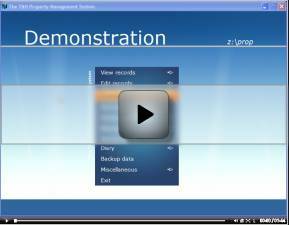 This feature will allow you to see information about where and when backups have been made. As we feel this option will be useful to all users it will be included in the system as a global option. This option combines existing listings of income and expenditure found throughout the system into one easy ledger screen allowing you see transactions and balances to any given date more easily. This facility is available at cashbook, client, property and tenant level and is a valuable tool for providing additional information to clients, service charge accountants, tenants, auditors etc. This feature is quick and easy to use; simply enter a date span for the system to display a balance brought forward, all transactions within the date span and a running balance. You can now select per tenant whether a credit note or a minus demand should print if a credit is due to a tenant. We can setup this option to default to credit notes or demands, to minimise the input required from you. Whilst viewing or editing records you will now be able to navigate 'up the tree' (i.e. when viewing a tenant you can go back to the property that tenant belongs to, then back to the client and even back to the cashbook the client is linked to if needed). This option was originally suggested by users and as we feel it is useful to all users, it will be included in the system as a global option. The Publish to Web demo website is now back online (http://www.clientreport.co.uk/demo). The site had been taken down recently to carry out some essential upgrades. These upgrades are in preparation for showcasing some of the new features that we have planned for the next generation of the service. You can expect a 'makeover' and announcement in the near future. Please note that the non-demo publish to web servers were unaffected. 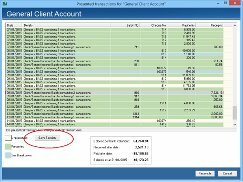 This tutorial shows you how to reconcile your system cashbook to your bank statement in 3 easy steps. 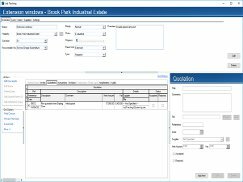 The cashbook reconciliation facility on the T&H System is a simple but invaluable tool allowing you to reconcile your cashbook as often as required. As you enter your income and expenditure into the system the cashbook is constantly being updated. The reconciliation screen will detail all income and expenditure up to your chosen date in a clear and precise format, allowing you to easily highlight those transactions on your bank statement whilst automatically taking into account any uncleared income and unpresented expenditure. Enter the date you wish to reconcile up to. You are presented with an on screen list of transactions. Select the transactions that appear on your bank statement (the system balance will automatically adjust to represent your bank statement balance). Unpresented transactions (a list of all uncleared income and unpresented expenditure). Keep these printouts with your bank statement to show at any given time that a full reconciliation has been done. Demands: the ability to select an alternative address to print on the demand remittance per client to cater for tenants who pay direct to the landlord. Printout archiving: improvements to the printout archiving facility to allow you to search through your archived printouts more efficiently. Tutorials: we are working on tutorials to guide you through using the more involved areas of the system, with worked examples and video tutorials to help you use your system to the full. The way you install system updates (free to users that subscribe to software support) has been redesigned to make installing new features easier and more efficient. An on screen update wizard will guide you through installing updates in a few easy steps and once installed you are ready to begin using your new features straight away. When setting up tenant charges, the system will now default to Yes to VAT if the property or tenant record is selected as vatted. You will now be able to export information more easily from the system. We have improved the record exporting facility to allow you to export cashbook and supplier records as well as improving the amount of data exported when exporting client, property and/or tenant records. As we feel this option will be useful to all users it will be included in the system as a global option. 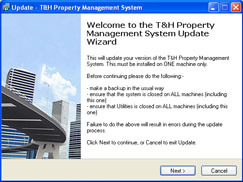 This tutorial will guide you through all you need to know about creating a backup of your property management data. Following the recent release of our new property management system and its huge success, we are pleased to announce a new addition to our team. Taz joined us this month and is a welcome addition to our programming team. His expertise are enabling us to expand areas of the system that will be of benefit to all. Taz is currently working on our website to provide quick and easier access to development and testing news, up and coming new features and system tutorials; he will also be extending our already popular Publish to Web facility with some exciting new features. If you're interested in learning more about this, please contact us. Record navigating: improvements to viewing and editing records so that you are able to navigate backwards, i.e. 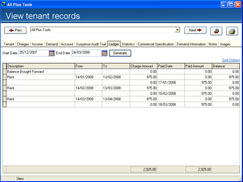 when viewing a tenant record you can view the property record it is linked to. Demands: the ability to choose per tenant whether suspense funds should show on their demands. Credit notes: credit note numbers to work in conjunction with demand numbers. Ledgers: this feature will draw together transaction listings from all areas of the system to allow you to see balances to a given date with ease. The facility to link to external files on each record has been extended. 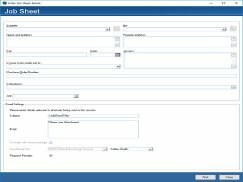 You are now able to link to external files on the cashbook and supplier records, as well as at client, property and tenant level. This feature allows you to access any external notes or information for each record with minimum effort. As you are aware, closedown archives information each quarter to keep your data under control and easy to manage. To prevent closedown being done at the wrong time, you are now able to setup a password which must be entered before closedown can be run. You are now able to print each record by simply right clicking and selecting print. The record printouts have been improved to show additional information such as account balances, and will take into account any collapsed or expanded sections so your printout will show the same information as you see onscreen. As we feel this option will be useful to all users it will be included in the system as a global option. The demand messaging facility has been extended to allow you to enter a demand message at cashbook level as well as the standard at client, property and tenant level. Any message entered at cashbook level will print on demands for all tenants linked to the cashbook. This could be used to enter bank account details to allow tenants to pay by BACS, for example. As we feel this option will be useful to all users it will be included in the system as a global option. Summers here and so is Alex! Alex has returned to us for the summer period following her successful time with us previously. Many of our older users will remember Alex from previous years and will know that she has a wealth of knowledge to easily and efficiently assist users with their property management and system based queries. 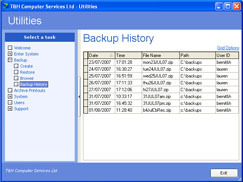 Backups: information to be stored about where and when backups have been made. Updates: improvements to the update process which will simplify updating your system. Suppliers: choose a preferred payment method for each supplier. This should streamline the posting of transactions, automatically defaulting to the set payment method for each supplier. Tenant charges: VAT to default to Yes or No depending on whether the property and/or tenant is vatted.